Radisson is home to over 40 businesses, making it a convenient place for both employer and employee. Covering 56 acres and spanning Rt 31, the corporate section of Radisson boasts a medical center, veterinary hospital, several manufacturing companies, the largest brewery in the Northeast, as well as our town offices. The name “Radisson” is that of the earliest known European Once simply called the “New Community of Lysander,” the area now named for Radisson has a long and interesting history, beginning just after the American Revolution. At that time, a grateful but impoverished Congress wished to reward its war heroes for their efforts. One of these heroes was young Colonel Marinus Willett. Congress paid its debt to Willett with the grant of a huge parcel of land. Over the years, the Willett family sold parcels of the rich farm land. John Jacob Astor purchased thousands of acres of Willett’s land and then sold small parcels to homesteading farmers.to visit the area. Pierre Esprit Radisson, a French explorer and trapper was initially captured here, he escaped, going on to form a military party and explore the Great Lakes area. He is the same person for whom the international hotel chain and Radisson outdoor product line is named, including the famous Radisson canoe. At the outset of World War II, the federal government, seeking a site to manufacture armor-piercing munitions, purchased 6,000 acres of the tract from Astor. Farming ceased and much of the land was fenced in as construction began on a large and intricate munitions works. The munitions works employed hundreds of Syracuse-area residents, but operated only briefly and closed down soon after the war. Machinery was removed, buildings demolished and slowly, the acreage returned to woodlands. Deer and other animals returned as the site became an oasis of trees, lakes, and woodland streams. The government provided 3,000 acres of this land to the State of New York for a game management area. The remaining 3,000 acres was retained for future use. A number of potential uses were suggested for this large, attractive 3,000 acre tract over the years. 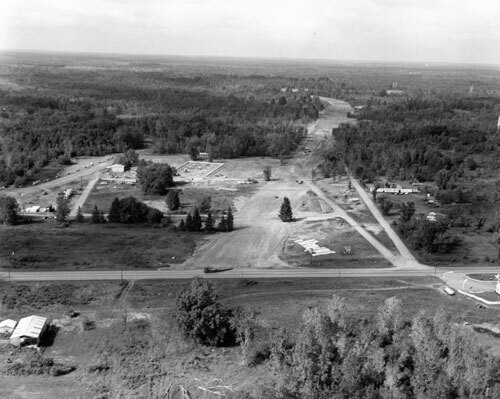 In 1968, officials of the New York State Urban Development Corporation (UDC) visited the area to discuss potential projects the Corporation could undertake that would benefit Central New Yorkers. The UDC was directed to the old munitions site. UDC officials agreed to study the possibility that this site could be used to absorb and control the rapid growth of Central New York’s northern area. After nearly a year of preliminary study, UDC presented its plan for a brand new community - Radisson. In 1974, the first home was constructed. Since then, our community has grown rapidly, with steady improvements in our amenities and overall quality of life. We welcome you to Radisson, and hope you will enjoy many years of working and playing here, calling this community home. Image above: Intersection of Rt. 31 and Willett Parkway (under construction). Photograph is looking north up Willett Parkway. The purpose of the Radisson Community Foundation, Inc. is to serve as the philanthropic arm of the Radisson Community Association, Inc. (a New York not-for-profit corporation), and to foster and promote planned charitable giving for the improvement, protection, and enhancement of the public lands, grounds, parks, and trails located in the Radisson Community in the Town of Lysander, for the enjoyment and benefit of the local community. As a 501(c)(3) organization, the Radisson Community Foundation enables us to accept monetary contributions and/or the donation of a commemorative bench in the Community. Monetary contributions may be submitted anytime, utilizing this Donation Form. The gift of a Commemorative Bench will allow individuals and/or organizations to provide a symbol of love, respect and remembrance in honor of a member or members of our community and to contribute to the beauty of our community while providing a useful resource. If interested, please review the details of the Commemorative Bench Policy then submit the Request Form. Thank you for considering making a donation to the Radisson Community Foundation. The Radisson Community Foundation, Inc. is a 501(c)(3) organization. As such, your contribution is tax-deductible to the extent allowed by law.